Makes towing safer for you and easier on your brakes. Safely uses your engine to control downhill speed when load is pushing you. Unit conveniently mounts just ahead of muffler for easy installation. Take a look at the components of the D-Celerator. An exhaust brake... is required for Dodge 3500 Pickup and chassis cab models pulling a trailer weight of 10,000 pounds or more." You know the score, you're out on the road in your motorhome, pulling your vehicle, and heading to that scenic remote area you've always dreamed of visiting. Or you're loaded to the max with your truck and trailer, headed to the middle of nowhere. Unlike what you would find with your gasoline engine vehicle, your diesel's providing both the terrific power and great fuel mileage for which you bought her. Suddenly, you come upon the steepest downhill grade you've ever encountered. Your heavy load is pushing you faster and faster down that mountain, and you're all but standing on the brakes just to slow down. Not only is there a sheer drop-off along the shoulder of the road, but you can see that traffic is coming to a stop at the bottom of the grade. You're beginning to smell something burning, and realize that your brakes are very close to dangerously overheating...how on earth are you going to get this rig stopped without a disastrous outcome? This is a position that will strike terror into the hearts of even the most seasoned drivers. Why the Diesel Braking Problem? Gasoline engines are designed with a carburetor or injection that includes a throttle valve often referred to as a butterfly. When the accelerator, or throttle, is not engaged, as when braking, the butterfly closes the air intake of the engine forming a vacuum effect that assists the vehicle in braking. This however, is not possible in diesel engines because they have no throttle butterfly. When the accelerator of the diesel engine is released, no compression is developed and the brakes of the vehicle are given the entire task of getting it stopped. It is for this very reason that the above scenario is such a common occurrence. overheated and quickly begin to wear. If you can relate to the downhill disaster story, you desperately need to find assistance with your braking problem. Look to U.S. Gear, whose sole purpose in designing the D-Celerator exhaust brake is to cure the problem of diesel braking. We provide the solution with two different exhaust brake models that use engine back-pressure to control down-hill speed. We offer both a traditional (standard) brake, plus a very sophisticated Super Duty Model. Before we review and compare the two models, let's first discuss how an exhaust brake works. In essence, the diesel engine is considered a pump. Both of our exhaust brake housings are added to the exhaust system, and whether via orifices (holes) in the butterfly valve (as with the Standard model), or two different butterflies (as with the Super Duty model), the valves help redirect exhaust flow (pressure) to assist the vehicle's regular brakes. This then turns the pump into a compressor, and the faster the pump is working (RPM), the more brake assistance you get. To control downhill speed, you simply adjust your gearing to the desired RPM. NOW, you are back in control of your vehicle's speed. This test was conducted using U.S. Gear's Standard vs. Super Duty model. Anything at 20 PSI or lower, does not provide much breaking. As shown, normal engine operating range is between 1500 & 2000 RPM. In that range the waste-gated Super Duty model has a clear advantage, while the orifice regulated Standard model just hits 20 PSI at the very top of the normal operating range. This model is most effective at a much higher RPM as illustrated. For the budget conscious diesel owner, not encountering continuous hard braking situations, the D-Celerator Standard Model is recommended. This unit safely regulates back pressure in the traditional manner (like most other exhaust brakes on the market) with orifices (holes) in the butterfly to avoid building excessive pressure. The inside diameter is the largest in the industry, and does not restrict engine performance when not in use. And remember this: All exhaust brakes are in the open position (not in use for braking), about 95% of the time! The effect they have on the performance of the engine in its open position is equally as important as the braking benefits realized when it is closed. This version is the only standard model available with exclusive computer-controlled electronics. 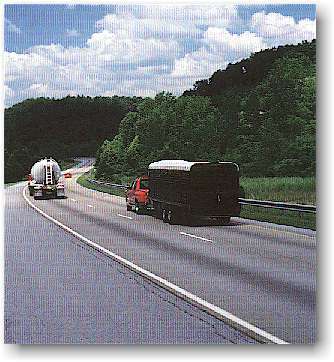 And while it will absolutely allow you to get your vehicle slowed down, you must gear to a high RPM in order to do so. 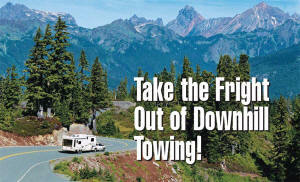 Be certain to carefully analyze your towing needs, your driving style and the terrain you typically travel. It could be that the Standard model simply won't do the job. If so, you need to step-up to the Super Duty model. Think again about the downhill towing disaster. If you can relate...whether you're pulling a load that is twice the gross weight of your truck, or you're being pushed hard by the tow behind your motorhome, you simply do NOT have adequate brakes. U.S. Gear's Super Duty D-Celerator unit, with it's patented waste gate by-pass port adds the safety, driveability, and brake-saving benefits you must have to control downhill speed. Not to mention the performance necessary for the climb back up! An oversize nodular iron housing consisting of two stainless-steel butterflies (one large, one small) is added to the exhaust system in front of the muffler. The large version is in the main passage, while the small butterfly operates in a separate waste gate by-pass port. Available from 4" down to 2-1/2" as either air or electric. When signaled, the large butterfly closes, creating immediate exhaust pressure for assisting the vehicle's regular brakes. Exhaust flow is now directed through the small by-pass port and released by the small butterfly at a pre-determined pressure (Due to this design feature, no orifices are necessary.). This allows pressure to generate more efficiently and maintains it longer, providing precision braking whenever you need it. Does not require valve spring changes or engine modifications. First, consider this: Over-the-road diesels were probably the first to ever be faced with the braking problems you are now encountering in our downhill terror scenario. And while these drivers have primarily relied on internal engine brakes, they are now adding quiet exhaust brakes since engine brakes have become outlawed in many mountainous regions due to their extreme noise problems. And which brand are these Over-the-Road drivers stepping up to? D-Celerator by U.S. Gear,...made in the U.S.A., #1 requested exhaust brake in the RV market. So ask yourself this, "Why would you choose anything less"? Now let's talk about the various exhaust brakes on the market today. Most are traditional, (Standard model). They do indeed provide downhill braking, just like U.S. Gear's Standard model does. However, there are certain circumstances when the traditional Standard Brake will not begin to provide the necessary braking for safe towing, hauling, or cross-country motorhome treks. It is for this reason that U.S. Gear offers you an option. Utilizing State-of-the-Art equipment in their nearly 500,000 square foot manufacturing facility, U.S. Gear incorporates into their D-Celerator models the most advanced technology in the industry. They are in fact the only exhaust brakes on the market with exclusive computer-controlled electronics. They come with an electronic control module and remote control panel to trigger the exhaust brake on and off. The remote control module has an on-off switch and a status light. As soon as you see the need for downhill brake assistance, simply push the button on the remote...push it again when it's time to turn it off. With the ignition on and the ECM (Electronic Control Module) on, the red light tells you the brake is activated. If the down grade requires accelerating in some sections, you may choose to leave the brake on and by pushing the accelerator pedal, it will turn off temporarily. Just push the pedal and it's off...lift your foot and it's back on. When you get to the bottom, push the red button on the remote and make sure the red light is off. Both D-Celerator units also utilize one or more butterflies to create immediate exhaust pressure for assisting the vehicle's regular brakes. In fact, knowing that butterfly-type exhaust brakes are plagued with binding caused by soot build-up, U.S. Gear built into their software program an open-close, open-close cycle every time the engine is started to minimize soot build-up. This, along with their in-line mounting and use of stainless steel componentry allows U.S. Gear to offer the best warranty in the industry. U.S. Gear is widely known as the Performance Specialist. And as the diesel engine owner, only you can determine the braking performance you need. Perhaps the Standard model is adequate, and possibly the Super Duty model is your only choice. Once again reference the chart to make your selection. Call 1-800-874-3271 for more information or for a dealer located near you.